Colorado has an amazing history and Deb and Jim Dysinger love sharing it with everyone who is interested. This month, the couple celebrates the one-year anniversary of Annie’s Gold Antiques and Collectibles’ move to Empire, while customers continue to rave of the new location. Both hailing from generations of collectors, the Dysinger’s have a passion for antiques while collecting and preserving history. 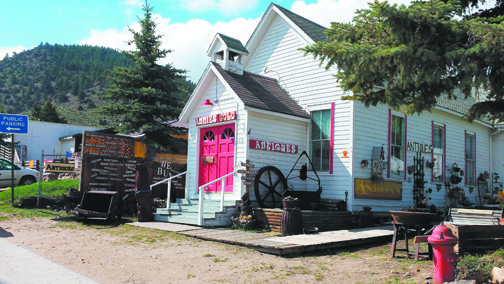 Annie’s Gold relocated from Idaho Springs in November of last year in search of more space. “We moved to Empire when this great building became available to us,” Deb said. “We needed more room than our last shop in Idaho Springs and love the location.” The shop is now in a little, white church building, with red doors and accents at 183 Eask Park Ave. (Hwy 40). Although Empire could be considered a bit “off the beaten path,” customers say the trip up the hill is worth it, and their Grand County customers couldn’t be more pleased. Deb says their regular “antique-loving customers looking for the rare and unusual items” are finding them again which has given them a “great first year.” The locals rely on Annie’s Gold Antiques and Collectibles for gift buying because of the diverse selection of gold and silver items. “We offer our jewelry at reasonable prices, and we will gift wrap and ship,” Deb said. The Dysinger’s feel they have one of the most extensive mining collections for sale in a shop in Colorado and buy antiques from locals and online. 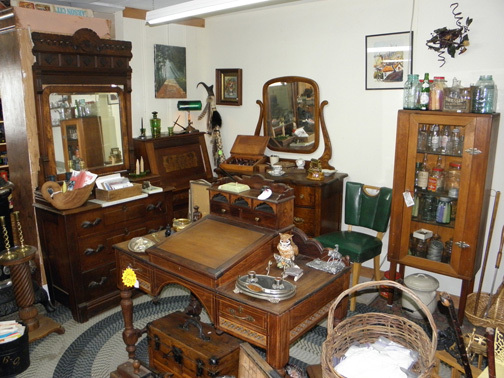 Annie’s Gold offers a large variety of antiques and collectibles such like antique sterling silver flatware and hollowware, vintage Christmas collection, Waterford, Baccarat, Belleek, Paden City, Fenton, Cambridge, art glass, Ken Nelson earring collection and fine estate jewelry. If interested in mining items, check out the blasting cap crimpers, blasters, maps, photographs, miners candlesticks, tram cars and ore buckets along with primitives, linens, glass, crystal, hardware and more. They also house a library filled with Colorado information as well has a reference library. Deb got her thrill-of-the-find type curiosity from her father who always wanted to be a gold miner. He would collect 100s of mining claims and mills in Clear Creek, Cripple Creek, Lake, Park and Teller counties over the span of four decades. Acting as his “Girl Friday,” Deb helped by mapping, finding corner markers on claims acquired and driving her dad to meeting after meeting. Local Assay reports state almost 90 percent of the gold and silver in these claims have yet to be recovered, but due to the current state of the economy and current mining and milling laws, the value of these claims has dropped significantly since the cost to mine is too steep. “The gold and silver may never make it to the surface with current laws,” she said, “but it is down there.” Deb and Jim find the true value of these claims are their history. Jim’s extensive knowledge of antiques comes from his parents’ antique and collecting business, which they had for 60 years. A far cry from the three-piece-suit Jim wore in his banking days, he has spent the last 10 years learning and studying all he can on mining and artifacts of Clear Creek county. He says he doesn’t miss those days in a cubical and looks forward to their next great antique find. Customer must stop in often to see what Annie’s Gold Antiques and Collectibles has to offer, because nothing lasts too long and there is always something new to learn and see. The Dysingers are available at the store or by calling 303-569-2125. 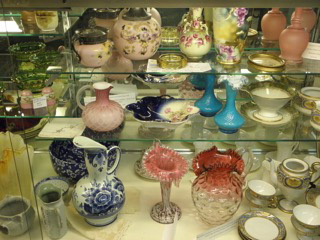 Tags: Annie's Gold Antiques & Collectables, Empire. Bookmark the permalink.